Jump to the GTM implementation you can click here but skim through the JS implementation because that is where I explain the functions. First we need to create a div that will act as the container for us to place the YouTube iFrame in. Create a new player object with the height (video.h), width(video.w), and VideoID that you want played and declare the events you are going to use. There are other events that are apart of the YouTube API but for this example we are only going to add onStateChange and onError. There are other player events that you can listen for like Player Quality Change and Volume Change, you can read about those here. onStateChange tracks when the player switches from different player states like play, pause and end. This is the main method that we will be using for our video tracking. The value that the API passes to your event listener function will specify an integer that corresponds to the new player state. In my examples below I will be using the namespace values. onError event triggers when their is an error with the youtube iframe player like if the video isn’t loading. This is great for QA and site redesigns knowing which videos are broken on your site. 2 – The request contains an invalid parameter value. For example, the videoID is videoId: ‘M7lc1UVf-VE’ that we declared in step 3 is wrong. Make sure it has 11 total characters and none of them are invalid. 101 – The owner of the requested video does not allow it to be played in embedded players. 150 – This error is the same as 101. This post is going over the basics of video tracking so the code is going to be… well, basic. I am planning to write posts in the future on more complex functions that I’ve created to analyze the video viewing behavior in different ways but I need to clean them up to make sense. Here is the first function for onPlayerStateChange I want to call out 2 specific things with the youtube API that I accounted for/modded. When the player starts playing instead of tracking it as ‘play’ I track it as ‘started’ in order to be able to calculate the completion rate. In the YT.PlayerState.PAUSED: case I check the time of the pause because I noticed that when the video reaches the end it actually triggers a pause event right before the end event. So if the current time – the duration = 0 then don’t track that pause. The event label is capturing the video AND the time stamp in the Play and Pause cases and is separated by a pipe ‘ | ‘. This will let us split on the pipe and create 2 data values and then perform some cool calculations and really get a lot more out of this solution. And now you’re tracking your video events! Continue reading if you want to see how it works with DTM. 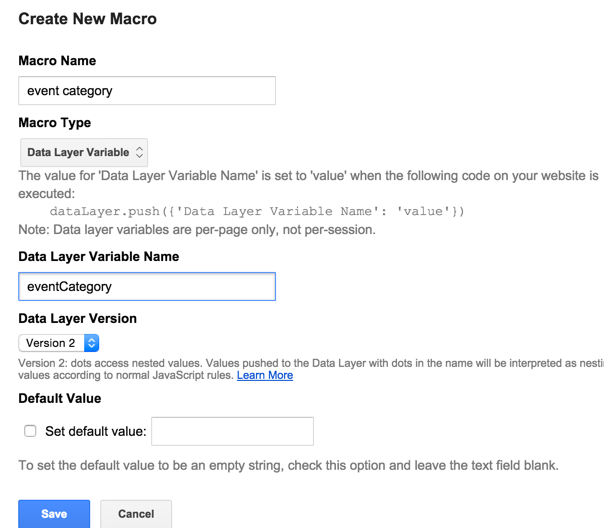 If you are using Google Tag Manager you would want to set up 2 tags and 3 macros. Create one for eventAction and eventLabel the same way. Copy the following code to the HTML container. Notice that the code pushes all the video events to the dataLayer and then we grab them from the dataLayer and execute the GA tracking. 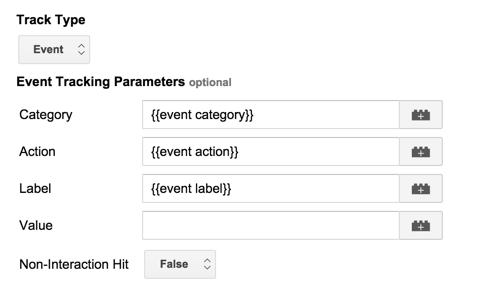 Set the track type to event and set the macros that we just made to the values of Event Category, Action, and Label. And, boom. You’re tracking your video! 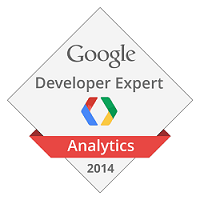 Once you have that tracking and all the data coming in you can use the Google Analytics Add-on extension to get the data in google sheets and do some cool stuff. Video ends event / video starts event. You can split this up in Google Sheets with =split(A3,”|”) if cell A3 contained the video labels. Or if you an excel person you can split them with ‘text to columns’ under the Data Ribbon. * Note: The last 2 can’t be analyzed in GA right now because it requires making calculations or mods on the data. I live in the Google Analytics Spreadsheets Add-on and highly suggest you check it out if you don’t have it installed. It’s great for pulling in data and doing your own calculations or customizing the data and dimension names to be more friendly. What other ways are you using the Youtube Player API, are you tracking other event? Please share in the comments I’d love to other creative uses! And of course let me know if you have any questions or feedback. Hi, thanks for reading! If you liked this post and saw value in it please consider sharing it. There are share buttons at the top.